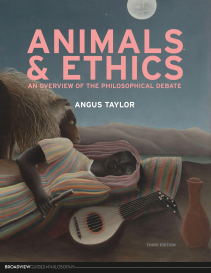 I enjoyed this interview with Angus Taylor, author of Animals and Ethics. Toward the end, the host talks about a point that's often made by my students. "You can't really liberate animals like chickens and cows because they don't have an ecological place anymore, so there's not really an end point for them other than letting them die out...."
My students often assume that "liberationists" must want to throw open the doors and let the billions of animals out. How could liberating a species mean exterminating it or radically reducing its size? Their assumption about "liberationists" is understandable, considering the way animal rights authors throw around comparisons to slavery. Abolitionists wanted a better life for slaves, not no life at all. Angus points out that extinction is sometimes the right way to go. If some nefarious operation was genetically engineering submissive servants for majority benefit, the right thing would be to end it and phase out the servants, not keep breeding them and set them all free. OK, but I can see my students' puzzlement. If you wanted to phase out the servants, you wouldn't call that "servant liberation"! Should people against animal farming really think of themselves as liberators? Well, what's in a name? But there's an interesting underlying issue here. There really is some question who is the truest friend of domesticated animals. If you're really "for" them, can you really think their lives are so pitiful and worthless that it would be better if they didn't exist? Anyhow... I need to get a hold of Angus's book. My little secret is that I have not read the entire animal ethics literature. I'm especially ignorant about recent continental writing about animals. This book looks to be the comprehensive survey that would solve all my problems. Yes, the literature is vast. My syllabus is bursting at the seams. I am curious about the continental stuff, though. If someone wants to tell me "the one continental book everyone must read" I'll be grateful. I know little about this, too. But (a) the anthology edited by Peter Atterton and Matthew Calarco is probably one place to start. (I've flipped through that; there are short readings + commentary.) (b) there's a book I have but haven't read by Kelly Oliver called Animal Lessons; she works through several of the continental thinkers. (c) Take a look at Cary Wolfe and Matt Calarco's contributions to the discussion in The Death of the Animal by Paola Cavalieri (There are aspects of C's argumentation I think are wrong, but I think this is a great book overall)--this book is an interesting meeting place of "analytic" and "continental" thought about animals. Great, thanks. I think I might go for (c). "Meeting place" sounds good. Learning about what continental philosophy has to say about animal issues would be interesting. Keep your blog readers posted, please. If you wanted to phase out the genetically engineered submissive humans, you wouldn't call that "servant liberation"; but you could still call it "human liberation". Equally, working towards the extinction of farm animals is not "farm animal liberation" but it is still "animal liberation". Farm animals can live happy lives if allowed to live in appropriate surroundings - for example a cow might enjoy a nice big grassy field with some shade and a warm barn and other cows for company. But in a sense every domestic animal displaces a wild animal that you could make a case has a better claim to life on this earth. Ed--those are all nice subtle points! Yes, the fact that domestic animals displace wild animals is something that has to be kept in mind. You can't justify more and more and more domestic animals on grounds that it increases animal happiness, because the domestic replace the wild. On the other hand, is it realistic to try to move in the other direction, reducing the domestic and getting the wild to "come back"? The problem is that once land has become "monetized" people will want to keep it "monetized." So getting rid of a cow pasture might mean making a parking lot or a golf course, neither being full of wild animal happiness. So it just might be that maintaining existing grazing land (not increasing or decreasing it) is best from the point of view of sustaining lots of happy animal life. Provided, of course, that the animals are happy, which is another question. "If you're really "for" them, can you really think their lives are so pitiful and worthless that it would be better if they didn't exist?" Why doesn't this apply to things like communists who want the working class to bring about its own abolition as a class, or radical feminists who want to empower women so as to abolish the social category of 'women'? It seems to me that we need to distinguish how liberationists relate to people now, and how they relate to unborn people of a similar group. There's nothing that invalidates a concern for greater freedom and happiness for existing people in a lack of desire to produce more people that resemble them. Individuals have value, not identities like sub-species.